Laserderm began under the leadership of Dr. Sharyn Laughlin, M.D., FRCPS(C) and her husband Dr. Denis Dudley, M.D.,FRCS(C) in 1987. Dr. Laughlin had completed her speciality in dermatology in 1983 but was frustrated at the time by the lack of solutions for her patients for common occurrences like vascular birthmarks. She was intrigued by promising new laser technology and recalled her mentor’s advice that this technology should be provided by physicians with specialized knowledge of skin, i.e. dermatologists. She travelled to study under the late Dr. Leon Goldman, who is considered “the Godfather” of laser medicine. Under his tutelage, Dr. Laughlin saw how the selective nature of lasers could target the underlying concern while preserving the skin overall, providing considerably better outcomes than other forms of surgery or treatment. At the time, lasers were large and expensive pieces of equipment but Dr. Laughlin could see their huge potential. She was therefore one of three dermatologists to bring back the sub-specialty of laser medicine to Canada and the impetus for Laserderm was created. Dr. Laughlin and Dr. Dudley personally financed their purchase of their first laser system the flash lamp pulsed dye laser for the treatment of vascular birthmarks. They began treating patients when a new law by the government of Ontario called the Independent Health Facility Act came into effect to control the use of new technology by individual physicians. The law effectively terminated the treatment of patients that had been travelling from all across the country for life changing laser therapies. The public outcry was swift and vocal and the government quickly realized some form of action on their part was necessary. A government delegation was sent to reach an agreement and within a short time Laserderm became the first Independent Health Facility within the province. Patient treatment resumed and has continued to this day. Laserderm has grown from its first original laser system to now include more than twenty laser or energy-based devices, as well as cutting edge therapies in cosmetic dermatology. 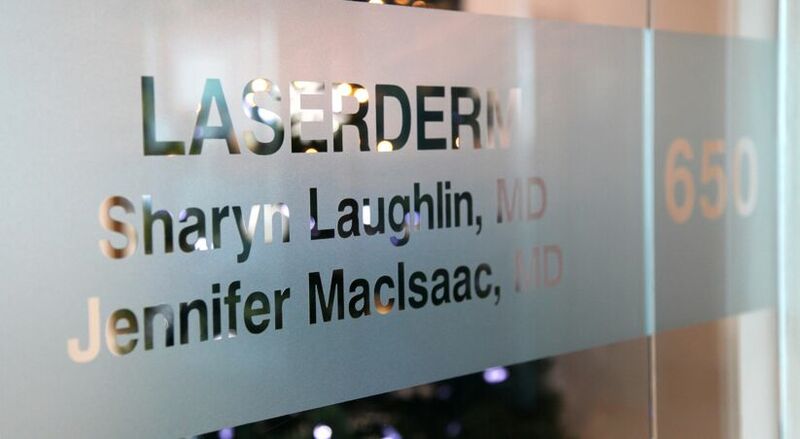 Under the medical directorship of Dr. Laughlin, Laserderm continues to be a centre for continuing research. Many of the original protocols for laser based hair removal, laser resurfacing, and other common procedures today were created by Dr. Laughlin and Dr. Dudley and their team. The duo have provided training to hundreds of professionals around the world, and Laserderm continues to train dermatology residents through the University of Ottawa, as well as offer a Laser and Cosmetic Dermatology Fellowship for board certified dermatologists. Interested candidates for the fellowship program can request further information by contacting us. Laserderm remains committed to its local, national and international community of patients, peers and professionals. It is more than the sum total of its technology. At its foundation, the Laserderm team of staff believe in providing the highest standard of care every single day and to every single patient. They are real people who are warm and compassionate while also capable and knowledgeable. Dr. Laughlin continues to ensure that her precept for care remains the guiding philosophy for Laserderm, “the right technology for the pathology, in the right hands!” We thank our patients for trusting their care to us and feel the full weight of that continuing responsibility. We are hopeful that the legacy of Laserderm as a Canadian centre for excellence in care will continue into the future.